FIVE companies have been shortlisted to build the first generation of trains for HS2. The fleet of at least 54 trains, capable of travelling at 360km/h, will be built early in the next decade to enter service in 2026. The bidders are Alstom Transport, Bombardier Transportation, Hitachi Rail Europe, Patentes Talgo and Siemens, who will all now be invited to lodge detailed tenders. This initial fleet is expected to be ‘classic compatible’ and built to the British structure gauge, meaning that its size will allow the new trains to continue beyond Phase 1 of HS2 between London and Birmingham to serve destinations on existing lines in the north west and Scotland. 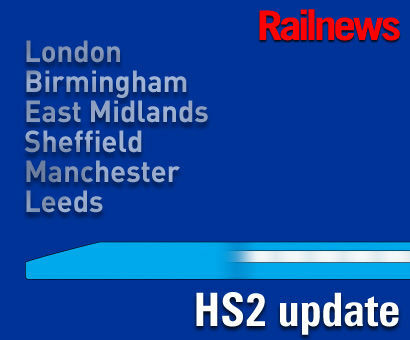 Larger trains, suitable only for HS2, are likely to follow when the later sections of high speed line are opened to Manchester and Leeds in 2033. HS2 Ltd said the contract was expected to ‘create hundreds of jobs and boost Britain’s skills and expertise in the high speed rail sector’. Of the five bidders, only Bombardier and Hitachi are currently equipped to build the trains in Britain, but other bidders could set up a construction plant in this country if they win the contract, which is expected to worth £2.75 billion. Rail minister Paul Maynard said: “Thousands of skilled British jobs and apprenticeships will be created by HS2, which gets a step closer as we reveal the companies shortlisted to build the high speed trains.